As Here’s What You Missed On Glee informs us, the reason two of the three storylines from last week feel unfinished is because they are. Mercedes is still working on her duet with Santana, and Blaine is still hooking up with an older woman for money or something, I don’t know. That first one might even remain unfinished across the seasons if Santana is truly written out of the season finale, but I have the utmost confidence in the producers to wrap it up with a single line before moving onto more important things, like lifting the spirits of the homeless through song. Until then, what Glee’s come up with for its penultimate episode is a deal where Sam adopts a dog and Mercedes makes him give it up and Kurt gets all huffy and saves New York’s old people. Truly the Red Wedding of Glee. “Old Dog New Tricks” is written by Chris Colfer, who claims his “two favorite things in life are animals and old people.” So Rachel gets to work with animals and Kurt gets to work with old people, one of his two favorite things in life. It starts when he meets June Squibb’s Maggie, former star of the smash flop Helen Keller: The Musical. She’s currently involved in a retirement home’s production of Peter Pan, and he decides to stop by on the exact day the star swings out for her entrance dead in her harness. The camera then swings toward Kurt in the audience as if it’s the spirit of Peter Pan, begging him to take over. Don’t need to ask him twice. As he rants to Rachel and Santana, “Gosh, you’d just think after everything someone would throw me a bone for once.” Like Isabelle Wright, or Carmen Tibideaux, or the state of New York recognizing equality so that he can get married. The idea of graduating on the same level with all your friends and then everyone taking off at different speeds is a goldmine, but Glee hasn’t genuinely dug in since Finn’s “lost” phase. Now, Kurt’s self-involvement might make a smart parallel to the Rachel story. She’s started an animal adoption nonprofit to rehabilitate her image, but it’s not about the dogs. Rachel’s only interested in herself. Perhaps Kurt is just trying to save Young At Heart so he can feel good about himself, or something. Perhaps, Other Brandon, perhaps. 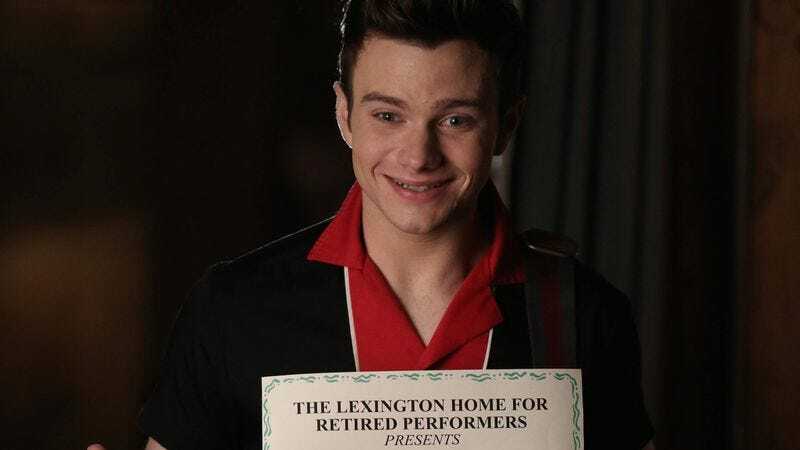 In fact, however, after an audition to “Memory” from Cats—which even impresses Billy Dee Williams and Tim Conway enough that they can now be seen and not heard for the rest of the episode—Kurt gets the part and really forges a connection with Maggie. So much so that he takes it upon himself to rescue her from her estrangement with her daughter. At first this, too, has promise. Melinda McGraw, in the only performance worth giving a damn about, counters every one of his entreaties with a flashback to her own childhood in which Maggie was not such a sweet old lady. She should have just sung, “It’s My Life,” at him. Bringing people together isn’t so easy, and it’s about time someone pushed back against Glee’s cynical interventionism. As McGraw shows Kurt the door—what’s taking security so long?—Kurt pulls out his ace. “My mom died when I was eight.” I’m not positive that’s the only time I laughed during “Old Dog New Tricks,” but it’s one of them. Naturally, it does the trick. Melinda McGraw walks in right as Kurt leads the cast in “Lucky Star” on opening night, and she spends the whole day with them. Guess I was wrong. It really is that easy! Praise be to Kurt. Think how much better the world would be if we would all just do what the Glee kids think. All the while there’s the problem of the old people, one of Colfer’s favorite things in life. Williams and Conway are glorified cameos, there to say a couple zingers each and then sit in the audience smiling as Kurt transports them back to their glory days by way of bleary dissolves from their present-day faces to younger head shots on the cast wall. No need to let them actually act when we can bus them to the Glee set and sing to them instead. Meanwhile Squibb is almost literally infantilized, paraded about in a nightgown and at one point transformed into little Wendy Darling. Lately Squibb’s been a bull, an acerbic steamroller on Nebraska and a dazed truth-teller on Girls. Here she has some of the usual Glee edge (when the original Peter dies, she responds, “Less than a week away from rehearsal. She was always so selfish”), but, like all Glee snark, it’s ultimately hollow, making for a shallow performance. Really she’s just a sad old lady being used as an object for Kurt. And not just one to make him feel good, though that’s the gist. There’s something in Kurt’s line to Melinda McGraw: “She had a dream, and she got lost in it.” She’s advice—a road not to follow for Kurt and his friends—and Kurt takes that lesson. He calls Rachel before his performance, which she can’t make it to due to an event for her charity that day, just to tell her that he understands and he loves her. Her reply: “That is very sweet of you, but I have to go because my best friend’s show is about to start.” He scans the audience and finds Rachel and the whole gang sitting in the audience, practically whooping. No wonder this storyline works so well. It’s actually about characters. Turns out Rachel has a gift for the cast: a second performance that night! So she has the old bags shipped to the diner, but even that’s a self-important lie. Really they’re there to be plants—moral support so that Rachel and her charity can perform “Take Me Home Tonight” at a successful dog give-away. This is the part where Mercedes makes Sam give up the dog he trained, because they’re the oldest married couple in history who have only been dating for two seconds. Props for the on-brand song and the shameless cynicism. Unlike the Kurt story, this one doesn’t get lost in the dream. It’s always about Rachel resurrecting her reputation, and it never even pretends that deep down it’s about the dogs. So what’s with all the schmaltz? Maggie tells Kurt, “I never used to believe in second acts, but you’ve proven me wrong.” Then there’s the closing song, during which the main characters just give dogs to people willy-nilly. That’s all it takes—just dropping a pound dog in someone’s lap. Even Melinda McGraw becomes an indirect object, words employed only to receive what the writer gives her. She too has learned to love Big Brother. Afterward Rachel gets an interview about her charity. At last she has pulled off a successful publicity stunt, and this story can end. She credits Santana, who credits Rachel, who credits Kurt, who credits Rachel, who credits their whole gang. Bring a barf bag. Then, as the cast fills time before the cut to black, Rachel goes zombie and stutter-laughs, “Yay-ay-ay-ay-ay,” which is like when someone says, “That’s funny,” instead of laughing. They all group hug in a line so that they don’t turn their backs from the camera, and Lea Michele’s face says it all. She can’t bear to be in this one second longer, awkwardly smiling while looking around for her assistant so they can get out of this mess as soon as possible. It’s the most honest moment in the episode. On the other hand, Rachel is becoming more self-involved by the day, and it’s a blast. “But I’ve always been my cause!” Hopefully she doesn’t lose that small-town, big-voiced underdog core to keep the character from becoming pure type, but her selfishness is so much more convincing than Santana’s hot-cold routine or Kurt’s whining. When Kurt attacks her for missing his big show, she bites back, “I am doing something good for the animals,” conducting every syllable like it’s another Broadway audition. After everyone sings, “I Melt With You,” to soothe the savage pound puppies, the animal control guy agrees to work with Rachel on a benefit. She turns around to squeal with her friends, and nobody’s there. I don’t know if that was improvised or a deliberate joke, but that’s one of the best gags in the episode. Where Have All The Supporting Characters Gone? “One Three Hill’s been on a hiatus ever since Elliott went to his yoga retreat and Dani’s roller derby team became state champions.” No word on Santana and Dani’s relationship. Glee’s all about the standalones these days, lived-in continuity be damned. That said, it’s nice to see Sam and Artie just hanging out playing video games. These characters are so compelled by plot (their ambitions or relationships or their friends’ ambitions or relationships) that it’s rare to see what their lives are actually like.